Oh, those glam guys from Nordic countries! They surely know how not to look trivial on stage. 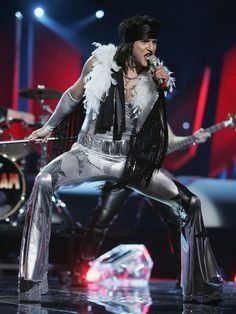 Remember those Norwegian Wig Wam rockers that exploded the stage of the Eurovision with tight silver costumes and white boa (and didn’t come last) in 2005? Not to forget world-famous monsters Lordi from Finland that won the same song contest two years later. Maybe D-A-D is a potential new candidate from Denmark? The Danish rock band, known for surprising outfits and musical instruments, shocked the audience yet again. Their bassist, Stig Pedersen, got onto the stage with a guitar that looks like a giant iPhone! It is only a two-string bass but the crowd welcomed the musician’s creativity with huge support. And that’s not the craziest band’s invention. D-A-D have never looked for easy roads. They dress up in odd costumes and decorate the stage with weird stuff (for one, a 7-meter-long giant fish). Back in the band’s earlier career, in mid-1990s, Stig once dressed as a toreador and played a… wait for it… an olive-shaped bass! But then again, if you can’t think of anything weirder, you probably haven’t heard about the German band Compressorhead… There’s hardly a more mindblowing view than seeing robots actually play real instruments and bang their heads. And while the band creators’ Kickstarter campaign hadn’t raised enough funds, recently the band somehow did manage to build a 350-kg vocalist! Take a look at their 2017 ‘Ace of Spades’ live performance below. What’s the oddest rock outfit or instrument you’ve ever seen? Be the first to leave your comments and stay tuned with AlteRock Facebook and Twitter to never miss on the news about your favorite alternative music!